Activists around the globe are working to use the Olympic Games as a rallying call to highlight some of the injustices and repression that is perpetrated by Chinese authorities against the ethnic minorities of China. Their efforts have been met with tremendous support and media coverage, but for a solution to these problems world leaders must coalesce around a common stance. Whether they do so in the coming weeks and months will decide the fates of nations and peoples. As the Dalai Lama begins a contentious two-week visit to the United States and the Olympic torch continues its tortuous journey across six continents toward Beijing, the 2008 Games, already tarnished, have become a political as well as an athletic spectacle, with vying theories of human rights and how best to promote them. Groups devoted to causes as diverse as press freedom, Falun Gong, Tibet and autonomy for Uighur Muslims in China's far west have used the Games as leverage to highlight issues that had been relegated to advocacy chat rooms during most of China's long economic boom. Aggressive street demonstrations in London, Paris and the United States, and mounting calls for President George W. Bush and other world leaders to skip the opening ceremony of the Olympic Games in August  as a show of protest against China's internal policies, have produced a nationalist backlash in China. There, both the leadership and ordinary people resent what many see as a plot to disrupt the Games and damage China's image as a rising power, which the Olympics once seemed likely to burnish. Politics has not intruded on the Games to this extent since Soviet bloc countries boycotted the 1984 Olympics in Los Angeles in retaliation for a United States-led boycott of the Moscow Games in 1980, after the Soviet invasion of Afghanistan. The post-Los Angeles consensus that the world's foremost sporting event should remain exclusively a celebration of athletic excellence appears to have frayed. How political the Games will become, and whether international pressure on China will improve or worsen its policies on Tibet, Darfur and other delicate issues, has become a major worry for diplomats, athletes and commercial sponsors of the Olympics. Eberhard Sandschneider, a China expert at the German Council on Foreign Relations in Berlin, said that the protests around the Games had created an uncomfortable moral dilemma for Western democracies even as Chinese leaders dug in their heels. "The country is economically so attractive and by now so powerful that any measures we take will be met with painful countermeasures," he said. 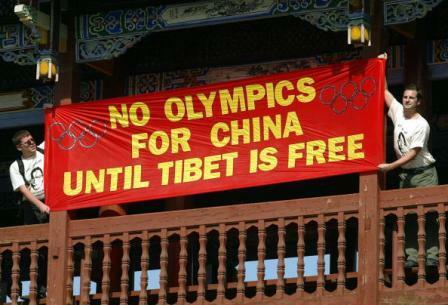 "The Olympics are important to the Chinese, but not as important as Tibet. Sovereignty and stability will always outweigh public relations." The French foreign minister, the human rights advocate Bernard Kouchner, finds himself torn - unable and unwilling to criticize the protesters, but understanding that loud street protests may make Chinese change more difficult. "We can't reduce foreign policy to human rights," he said, telling the newspaper Le Figaro that France wanted to "facilitate" renewed dialogue between the Dalai Lama and Beijing. But the protests "make a solution more complicated," he said. The most obvious pressure is on Western political leaders to engage in a symbolic boycott of the opening ceremony on Aug. 8 . Prime Minister Gordon Brown of Britain and Angela Merkel, the German chancellor, have said they will not accept invitations to attend the opening of the Games. Even the United Nations secretary general, Ban Ki-moon, a Korean, made it clear on Thursday [10 April 2008] that his schedule would not permit him to attend the opening ceremony. President George W. Bush, who plans to attend the Games, has said that he considers the Olympics nonpolitical but has not specified whether he intends to participate in the opening ceremony. Many members of Congress have urged him to skip it, and all three presidential contenders have suggested or urged that he reconsider attending. President Nicolas Sarkozy of France, who first suggested boycotting the opening ceremony to promote a renewed dialogue between China and the Dalai Lama, has himself not finally decided, trying to use his decision as leverage on Beijing. After denying stiff conditions for his attendance set by Rama Yade, his human rights minister, including the end of all violence in Tibet, Sarkozy said he would decide whether to go only after seeing if the dialogue was renewed. Speaking after the Paris protests, Sarkozy said: "It was sad to see the flame and the athletes booed, and I can understand that the Chinese have a problem." But "for the Olympics to go ahead in a peaceful fashion, dialogue needs to resume," he said. The European news media and public opinion appear to support a tough stand. In Germany, the cover of this week [Week 16, 2008]'s Der Spiegel magazine is the five Olympic rings retooled in barbed wire, with a picture of Chinese leaders underneath. The article focuses on the heavy-handed treatment of dissent, opening with the wife and baby daughter of a jailed dissident, Hu Jia. A cartoon in the French newspaper Le Monde showed a citizen "training for the Olympics" by facing his armchair away from the television set, and the leftist newspaper Liberation is selling a T-shirt for protesters. Leading advocacy groups appear unlikely to let the pressure die down before the Games. Supporters of greater autonomy for Tibetans have seen their cause catapulted into the headlines around the world, with an outpouring of support for the exiled Dalai Lama and widespread calls, including from Bush and most European leaders, for Beijing to engage him in a meaningful dialogue. Tsering Jampa, executive director for Europe of the International Campaign for Tibet, said the Olympic Games were the best hope Tibetans and human rights campaigners ever had to extract concessions from Beijing. "This is China's coming-out party," she said. "European governments should use this opportunity to really push the issues of human rights and Tibet. If heads of states are saying that they may not go to the opening ceremony, that helps." Martha Bixby, executive director of Team Darfur, a coalition of athletes seeking to highlight Beijing's support for Sudan, which Washington has accused of genocide in Darfur, said critics must prod changes in Chinese policy. Activist groups must ensure "that it's not just superficial change to make things look better, that it's actually something that's going to make a difference," she said. But the reaction in Beijing does not suggest much inclination to capitulate to demands from activists. Officials there continue to label the Dalai Lama a "splitist" bent on sabotaging the Olympics, and they have shown no signs of softening their approach to managing Tibet or renewing a dialogue with the exiled spiritual leader. On the contrary, Chinese are blaming foreigners for the tensions. Sarkozy's decision to leave the door open to a partial boycott of the Games prompted a populist appeal in China to boycott French goods, circulated on the Internet. Chinese users also circulated a photograph of a protester, in a cap with Tibetan colors, trying to grab the torch from a Chinese woman in a wheelchair, who was praised in Beijing for protecting the flame. China's fierce pride also covers a deeper defensiveness, a sense that China's rise has made it the target for the hypocritical anger of a wounded West, especially the United States and Europe, that resents such a successful new rival for global trade and influence. The reaction suggests that the governing Communist Party will probably respond if protests and boycott threats continue to escalate. "If any country takes actions that are seen as harming the dignity of the Chinese people, it will have to act," predicted Shi Yinhong, professor of international relations at People's University in Beijing. Shi said any boycott would not influence China's overall foreign policy. But he predicted Beijing may take a harder line in trade talks with European partners, especially France. "People are very unhappy with the French president," he added. By contrast, China would be able to save some face if European leaders simply declined to attend the opening ceremony without linking their absence to Tibet - the tack chosen by Brown. Then, Shi predicted, "China will remain quiet and say, 'Our invitation remains open.' "
While the Olympics have often been used for political purposes - famously by Hitler in 1936, when Jesse Owens made such a mark, and even in 1968 in Mexico, when American athletes used a black-power salute to highlight discrimination at home - this controversy is also underscoring a sharp disconnect in perception between China and the West. Even as the Chinese security team protecting the torch has drawn pungent criticism in Europe, its members are portrayed as heroes in the Chinese news media for guarding the Olympic flame and, by extension, protecting the apolitical Olympic spirit. The procession of the flame, now being limited and rethought in places including Indonesia, has been a rallying spot for other complaints about Chinese interests and practices. A good example is the Kenyan Nobel Peace laureate and environmentalist Wangari Maathai, who pulled out of this weekend's leg of the relay in Tanzania in protest. "I am troubled that these Olympics, rather than being a unifying movement, have become most divisive," she said. Still, she called on China to help defuse tensions in Darfur, Tibet and Myanmar. "In all of these issues," she said, "China can make a difference, and that is what the world is urging them to do."